I just finished re-reading Laura Ingalls Wilder’s Farmer Boy, and oh me, oh my, the descriptions of the meals the Wilder family enjoyed is enough to make anyone salivate! Book three of the Little House collection, Farmer Boy documents Laura’s husband, Almanzo Wilder’s childhood in New York State. When, at last, they went to dinner, there on the table was a big dish of them! Mother knew what he liked best, and she had cooked it for him. Now, I don’t know about you, but the thought of frying together apples and onions peaked my curiosity, especially because apples’n’onions were mentioned regularly throughout the book. After doing a little research and finding out that apples’n’onions were traditionally fried up with bacon drippings or lard (though butter can substitute), I was even more compelled to try it! After all, everything is more delicious with bacon, right? My first taste reminded me of delicious Thanksgiving and Christmas dinners, with savory/sweet stuffings and pies, so it made sense to couple the delicious, homey apples’n’onions with a roasted bird, and the Cornish Game Hens I had recently purchased made the cut, although you could also use a large whole chicken, or wild pheasant or partridges (the sweetness of the apples will perfectly balance the wild game). As you can see from my photos, I did not use two Granny Smith Apples. 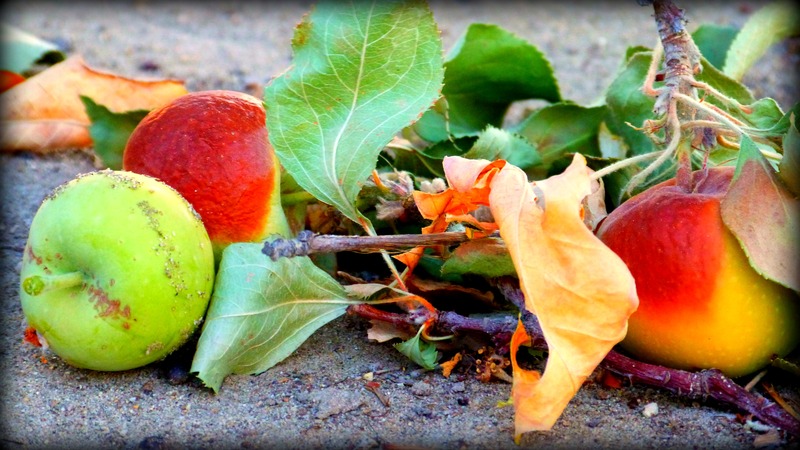 Instead I finally made use of my severely neglected, unidentified backyard apple tree whose tiny, tart apples usually serve as a feeding ground for our very lucky local birds. I admit this with a pang of guilt for not using this dependable yearly resource. 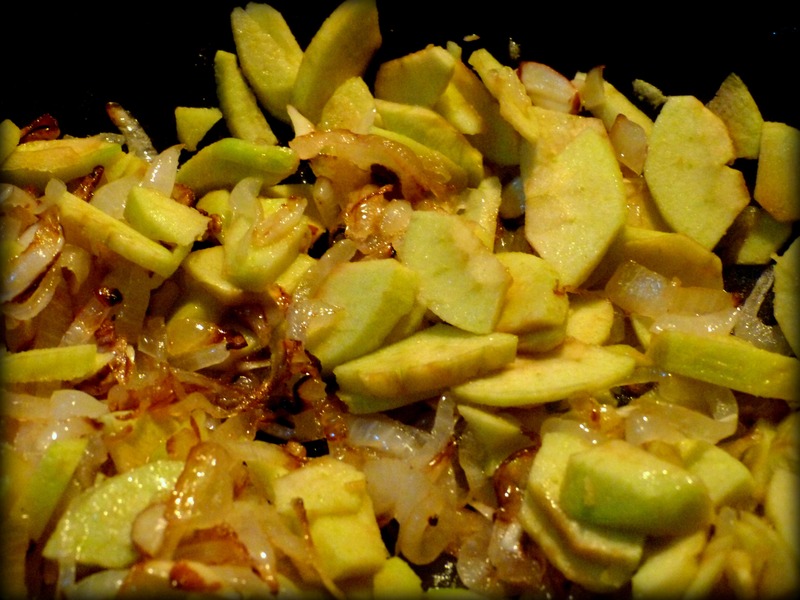 And so, I decided to use the crisp tang of these tiny apples to recreate Almanzo’s favorite dish, albeit with a twist. Heat a frying pan or skillet on a medium heat and dissolve the 2 Tbsp of bacon drippings. While it’s heating up, halve and thinly slice your onion. The thinner the slices, the faster they will caramelize. Tip the onion into the pan as soon as the drippings start to pop a little from the heat, stir to evenly distribute, sprinkle with a half teaspoon of salt, then allow to cook uncovered, stirring every few minutes until they begin to soften and gently brown –about 20 min. Meanwhile, peel and core your apples, then slice them thinly as well. Add the apples to the browned, caramelized onion and stir to evenly distribute and glaze the apples with the bacon drippings. Cover and cook on low for 15 minutes. To prepare your games hens or large chicken, first ensure they are fully defrosted if previously frozen. Rinse under cold water inside and out, then pat dry with paper towels. Scoop up the extra tablespoon (or more) of bacon grease and gently massage all over into the skin. This will help keep the skin moist during cooking, and also help crisp it up at the end. As soon as your apples have lightly softened but before they turn mushy, stuff your hens using tongs, equally distributing the apples n’ onions between the hens. Divide the thyme up equally and press into the remaining space in the cavity, then using some butcher’s string, tie the legs together. Tuck the wing tips under the chicken — it might take a little wrestling but they’ll eventually stay. 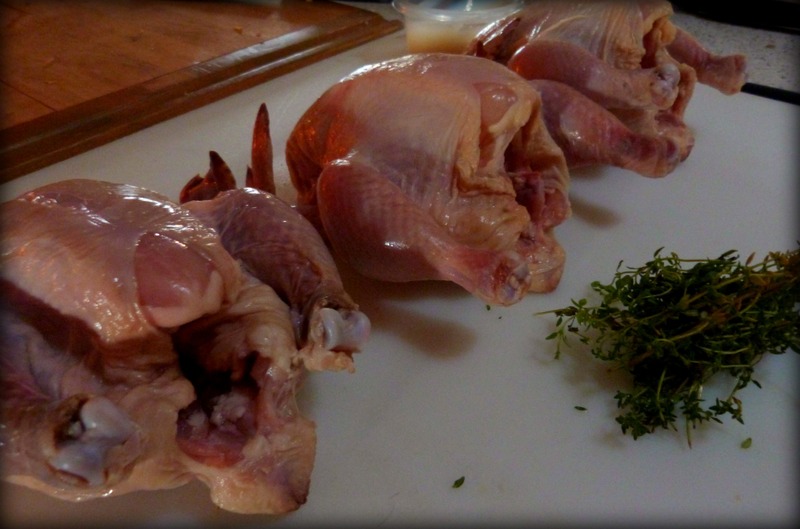 Julia Child called the wing tips the “nubbins” and always tucked them underneath the chicken for roasting. Far be it from me to deviate from Ms. Child’s recommendation! Prepare the roasting pan by placing three tbsp sized pads of butter under each hen, then generously season each hen with salt and black pepper. 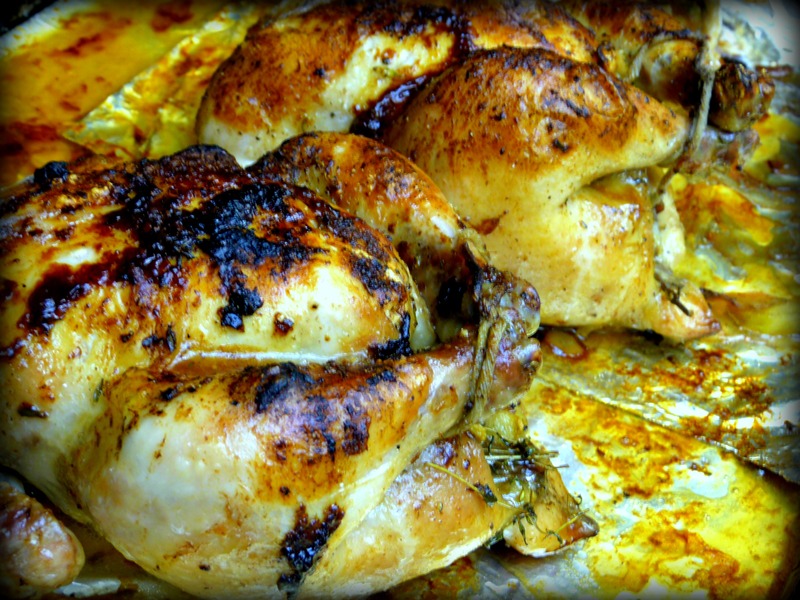 Place your chickens in the oven and cook for an hour at 375F, basting with the drippings in the bottom of the pan every 20 minutes. I find roasting meat to be a rather imprecise science when following various recipes, so I’m going to give some general pointers because I know your oven will be different to mine. 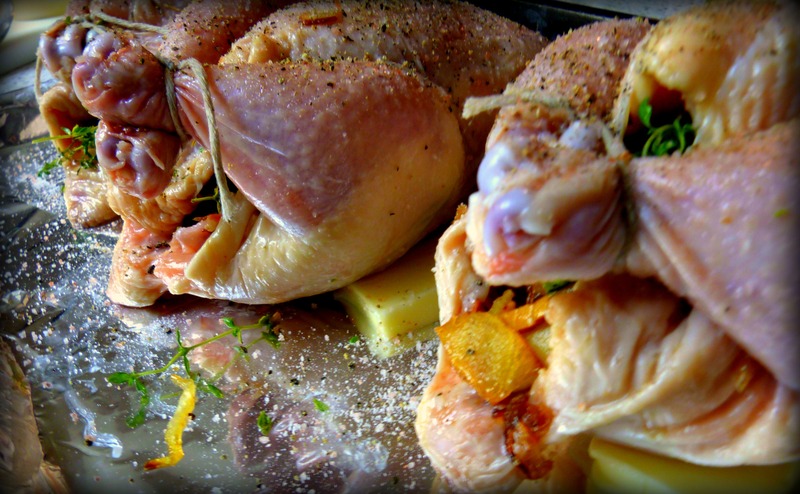 – If after 20 or 40 minutes the skins on your chickens are looking quite brown and crispy, turn your oven down to 350F. We want them to be brown and crispy, but not until the very end. – If you have a meat thermometer, use it! If you don’t have one, buy one! I cannot recommend a cooking tool more highly, other than sharp knives. I like chicken cooked to between 165F — 175F. At those temperatures it’s fully cooked, safe to eat and moist. Remember, the higher the temperature, the dryer and chewier the meat, but please don’t eat chicken that registers below 165F. – If you don’t have a meat thermometer, check for a fully cooked chicken by stabbing the thigh and breast meat, looking for clear juices. Another good indication your chicken is done is ease in pulling off a leg. If it stays firmly in place, cook longer in 10-15 minute increments until it readily comes apart. – Once you’re certain the meat is done, put your oven on broil and whack up the temperature to 500F for 2-5 minutes watching carefully for lovely brown skin — rescuing just before anything is allowed to burn. Pull your hens out of the oven, allow to rest for 5 minutes, then serve with a green salad or mashed potatoes (why not both?). Okay, I’m hungry after reading that, and by the way, tried to salmon dish, fantastic, and simple!! Okay, Janet my partner cooked it, but I enjoyed it…. !